Do the results of The Star’s “Monday poll” reflect a turnaround in public sentiment regarding a new, single terminal at KCI? Maybe there’s been a breakthrough and people are beginning to see the light. Or maybe the ballot box was stuffed. Hard to say. But whatever the reason, the results of The Star’s “Monday poll” showed surprising support for building a new terminal at Kansas City International Airport. From what I’ve heard and read, I would have thought people would oppose construction of a single terminal by a two-to-one margin. Instead, respondents to The Star’s online poll said by almost a two-to-one ratio that they would vote to build a new, single terminal. Having long crusaded in this space for a new terminal — instead of renovating one or more of the three existing terminals — I found the poll results very encouraging. That said, we don’t know how many of the more than 750 poll respondents are Kansas City, MO, residents, and it is Kansas Citians, of course, who would vote on whether to issue revenue bonds to finance the project. In addition, it’s possible that people with vested interests in building a new terminal, including political consultants and associates of Mayor Sly James — who favors a single terminal — might have encouraged people to participate in the poll. I have no evidence that occurred…haven’t even heard it. I’m just throwing out the possibility because the results are so contrary to what I expected. In case you haven’t seen the Monday poll before, The Star puts a question before readers, online and in print, every Monday, and people register their opinions online. The results are published online Tuesday and in print on Wednesday. — Despite the cost difference, the convenience of today’s KCI trumps any argument for a new single terminal. — The current KCI portrays a negative image to much of the traveling public, which should lead to building a new terminal. — If the airlines want a new terminal, they need to provide a significant amount of their own money to help finance it. 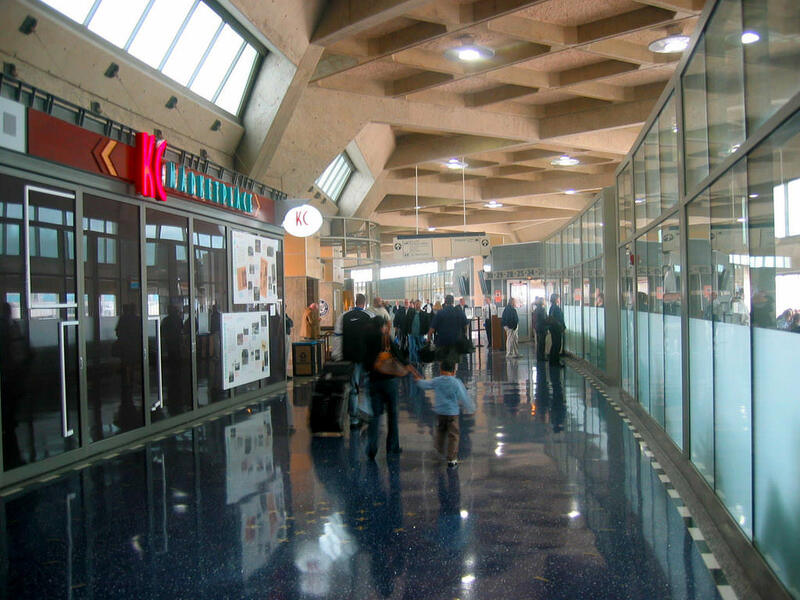 — Based on what I know now, I would vote to build a new terminal at KCI. On statement one, 62 percent of respondents either disagreed or strongly disagreed with the statement that the existing terminals’ convenience “trumps” arguments for a new terminal. On number two, 61 percent of respondents said the current KCI presents a negative image to travelers. On number three, 75 percent of respondents said the airlines should provide significant funding for a new terminal. And on number four, 66 percent of the respondents said they would vote to build a new single terminal, while 34 percent said they would not. A public vote on constructing a new terminal could come late next year or in 2017. The aviation department recently presented results of research that indicate it would cost more to renovate the existing terminals than to build a new replacement. Another benefit of building a new terminal is the two currently operating (B and C) could continue operating as usual while the new one was being built nearby. The glass “bullpen walls” at KCI. — KCI is a dump. Some people suggest the aviation department has let it go down because department officials want a new terminal. Maybe. But, in any event, KCI is completely outdated, plus dull, dark and lifeless. — The terminals are maddeningly inconvenient once you have checked in at the main airline desk and are routed into “bullpen” waiting areas. There you are held hostage until your flight boards, and you’re limited, for the most part, to buying a cups of yogurt, bags of chips and soft drinks while you wait to be released. — To be competitive with other cities our size that have built new terminals or have modernized those that already had a single point of entry, Kansas City needs a modern airport. I want Kansas City to be first class in every way. We’ve taken care of downtown, thank God (imagine where we would be without Sprint Center and the P&L District), and now it’s time to get a new KCI. Come on, Kansas Citians, swallow hard and vote “yes,” when the time comes, for a modern airport we can be proud of. Jim as I understand it out-of-towners like me would pay part of the costs through ticket prices. KCI is beneath the dignity of a resurgent KC. In addition to your observations, I frequently found myself sitting on the floor waiting to depart with no charging station. What apparently many in KC see as that comfortable old pair of jeans looks shabby to the rest of the world. If KCI only does enough business to warrant using 2 of the 3 existing terminals, how can we justify a bigger, billion-dollar single terminal? Having said that, in the end, the group that convinces voters that its plan provides the best security will prevail at the polls — no matter which plan costs more. I think it would be about a billion either way — new terminal or renovating two of the existing terminals…I’m going to be working in that campaign trying to convince people a new terminal is the best plan. Those so-called polls aren’t worth the pixels they’re printed with when it comes to gauging public opinion. They drive web traffic, that’s about it. That being said, I agree a new terminal is a vital to the long-term health of the community. I wrote The Star’s first story on this new terminal issue back in July of 2007 and the reader reaction to the idea was overwhelmingly negative. I don’t think there was any story I wrote in my 20 years at the paper that generated more phone calls and e-mails than that one. The issues that airport officials (rightfully) stated as reasons for changing to a single-terminal system included the inordinate amount of security checkpoints, multiple HVAC systems to maintain and the inability of concessionaires to make a profit. But none of those issues resonated with those angry readers I had to deal with. All they wanted was an airport they could get through quickly. And I suspect that many of them were the types who are simply adverse to any kind of change. I doubt if those folks who expressed their outrage to me more than 8 years ago have changed their minds or gone away, so I must say that I am surprised by these poll results. You get the comment-of-the-month award, Gayle. I’m honored to accept, thank you. Jim, are you wondering, as I am, if the suicide by the firefighter has anything to do with the Independence Ave fire and subsequent investigation? I hadn’t read the story until I saw your comment. The victim worked out of the same fire station as Leggio and Mesh. I hope more details emerge soon and that reporters ask the question you’re asking. Actually I think just one of them, either Leggio or Mesh — the other worked out of a different station. But the firefighter who was shot and killed by the KC police downtown in 2013 did work out of the same station as today’s victim. Meh – all hot air; regardless of whether a new single terminal is built or we refurb the existing design, people are still going to use the airport. It’s not like they’ll opt to fly to Denver, Chicago or even St. Louis (there’s a REAL horror show) and then drive to Kansas City. Though I’d opt for the refurb – estimates from the general contractor showing the refurb as being more costly should be taken with a cowlick of salt. And in either happenstance the cost overruns will stagger our imagination. So this idiotic plea to our civic pride is not only misplaced, it disingenuous as well. Which brings me to a more salient point: like it or not we’ll pay for this, City Hall’s protestations aside. What, we’re going to drive to Denver, Chicago et al and fly out of their airports? No, so all the new fees implemented will come out of our tickets as well. What? Are we made of money? It’s enough, now that Kansan’s are legally able to claim a rebate against the 1% eTax, to make me move less than the half mile west across State Line. In Pittsburgh this week — tale of two cities. First, the security section at KCI has been reconfigured to make passing through security and boarding a plane a cramped obstacle course — deliberate? Some local passengers believe it is and the intended purpose is to convince passengers that we need a new terminal. Pittsburgh — The airport has lost lots of tenants after US Airways pulled out following a hike in airport fees. Could that happen here? Could we loose some airlines and fail to attract new ones because of the inevitable increases in fees to airlines? Makes ya wonder whether or not the city cut a deal with Southwest, doesn’t it?